There are so many truly phenomenal (and wacky) things about the human body. 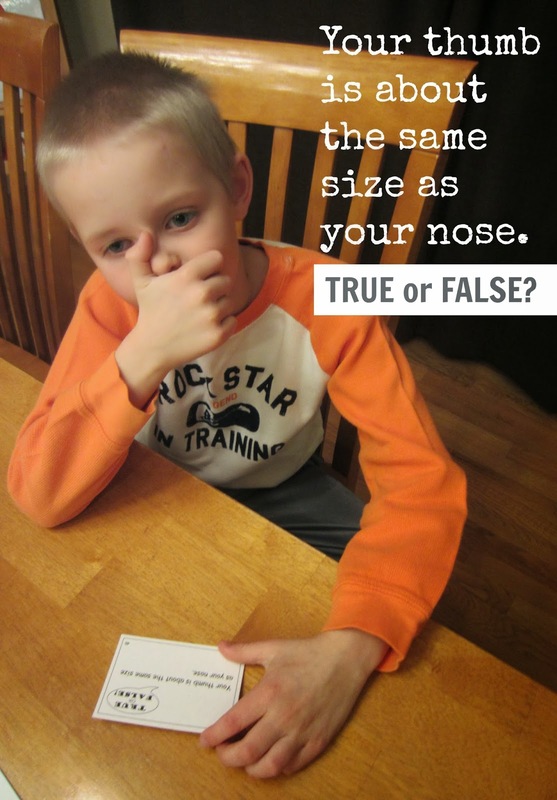 To help my son explore all these wonders, I made a true/false trivia game with some pretty weird facts. Playing is simple. The game board is made from six sheets of paper. Tape them together so it folds easily for storage. The game pieces are made from sticker paper and wooden disks (3/4-inch in diameter). Once you've found a die and cut the game cards apart, you're ready to play. Download the game board, game piece cut-outs, and 50 game cards (a 14-page PDF) here. And don't forget to download and print the answer key, too! 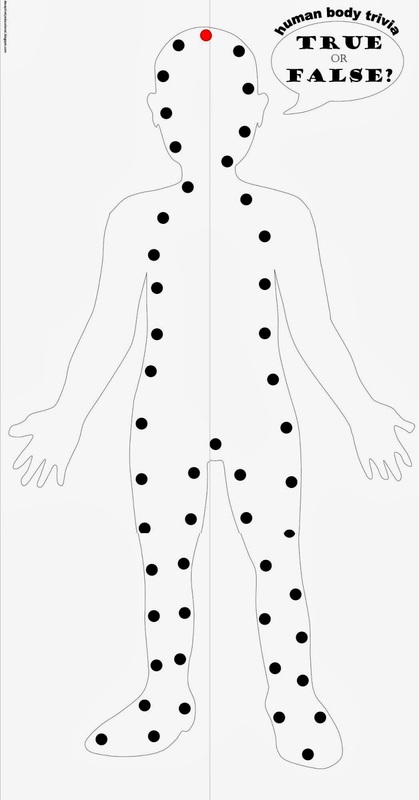 Players put their game piece on the red dot on the game board (at the top of the head). 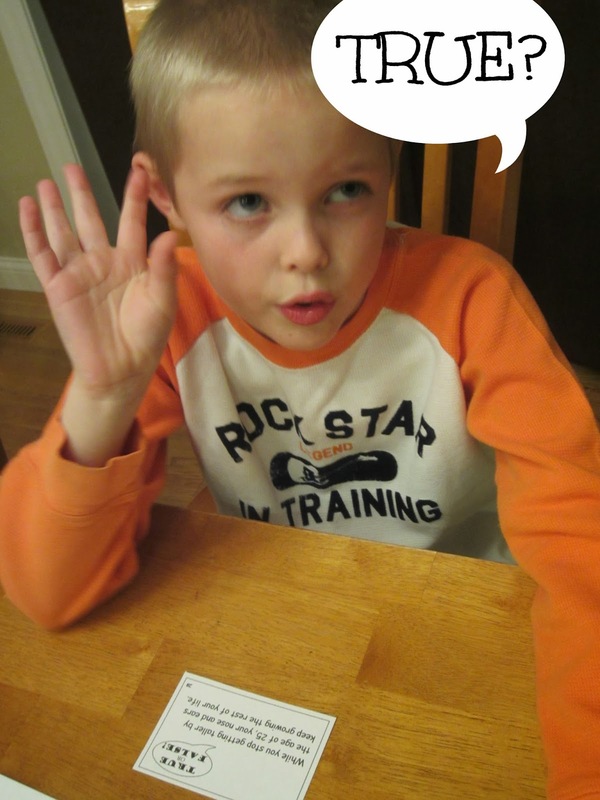 The youngest player goes first and picks a card off the deck, reads the statement, and decides if it is true or false. He/she tells the opponent and announces the number in the lower right corner of the card. The opponent checks the answer sheet, and if they are correct, the player tosses the die and moves forward the number of spaced rolled. Play alternates between players. Whenever the player guesses incorrectly, no move is made. The first player to make it all the way back to the start wins! 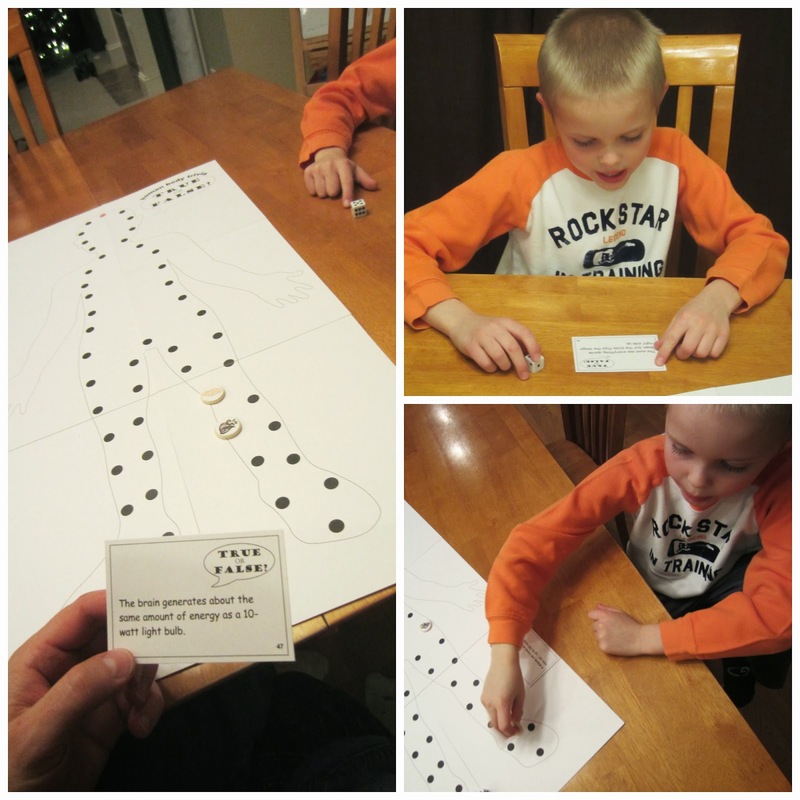 Looking for a great book to pair with this activity? Check out one of these three. All of them got our stamp of approval! NOTE: Since I created the game and, therefore, knew all the answers, my husband got the privilege of playing this with our oldest son. Needless to say, BOTH of them were stunned by what they learned!! I keep thinking about a trivia game made from Percy Jackson's series - my daughter adores them. 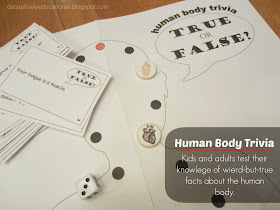 I like mechanics of your body game and thanks for sharing your printable version! This is AWESOME! Thanks for sharing it!! I think my two older kids (ages 5 and 6) will love it. Thank you so much - my son loves biology and will really enjoy this. Thank you for making this so easy to print and use. Why can't things be this easy. This is perfect for a family fun night where I don't have to buy something new.